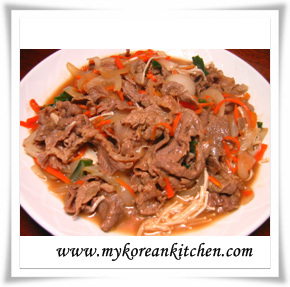 Who loves Bulgogi (불고기, Korean BBQ beef)! Everyone! Seriously, I haven’t met anyone who doesn’t like it yet. I actually have developed a pretty epic Bulgogi recipe using a homemade Bulgogi sauce, so you should definitely check it out even if you don’t like cooking it from scratch. 😉 Seriously, the sauce is so easy and quick to make! 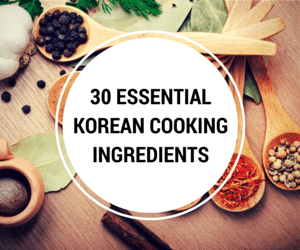 But since you’re reading this post, I’m going to assume that you don’t really want to put any effort into making the Bulgogi sauce by yourself, correct? In general, I don’t like buying instant sauce for cooking. It doesn’t taste very natural to me. Also they actually don’t taste that nice compared to a homemade version. Though, I will admit that every now and then (like once a year), I do buy a bulgogi marinade for convenience. This bibigo Korean BBQ sauce is my first preference but if it’s not available, I would get CJ bulgogi sauce. Essentially both of these are manufactured by the same company but they are just two different brands. There’s a suggestive guideline on the back of the bottle as to show how much marinade to use per weight of the beef. 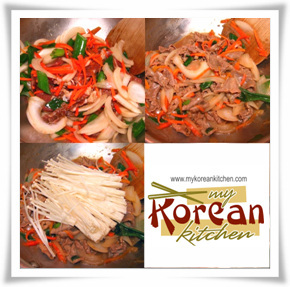 In the below recipe, I will show you how I normally cook Instant Korean Bulgogi! Enjoy! Heat up your wok / skillet on medium high heat and once heated add some cooking oil. Add the meat and all vegetables (except for the enoki mushrooms) and stir occasionally. Once the meat and the vegetables are half cooked, reduce the heat to medium and cook further until all ingredients are fully cooked. Add the enoki mushrooms a few minutes before you serve and quickly stir it. Serve. Thx for sharing! By the way, should i add pepper & grated ginger in marinated meat or while frying them? Technically you don’t have to add them since it’s already included in the marinade bottle. I just like adding them additionally. 🙂 If you do add them, do it while marinating. As mentioned in the recipe, mix all marinade ingredients in a bowl then add the meat. Mix them well. That’s it. Can I use this to marinate chicken breasts as well? Hi Troy, Yes, you can use the instant bulgogi sauce for chicken breast. I even made this recipe with it. https://mykoreankitchen.com/chicken-bulgogi-burrito/ 🙂 Enjoy! 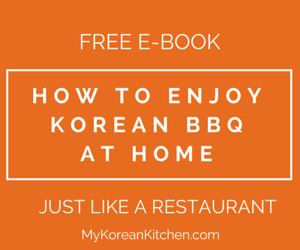 Hi, i found this recipe to make Korean BBQ pork. 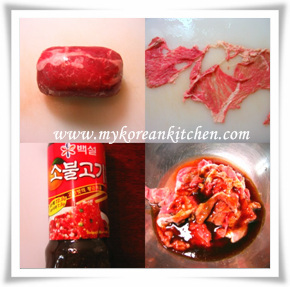 Can I use the fermented red pepper paste to make the daeji bulgogi? Thank you. Cece, I think you are referring to Gochujang? Yes, you can use that to make spicy daeji bulgogi. Where can I but this Baekseol at? if the sauce is too sweet, you can always add additional soy sauce and maybe some of your own particularly liked spices to tone down the sweetness. Hi! I LOVE your website. 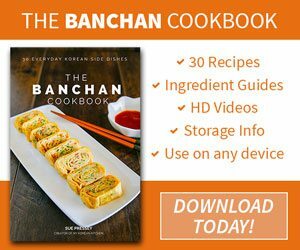 Hi, I chance upon your site while looking for Korean steam eggs. It’s not exactly what I was looking for but I’m totally impressed with your site. Now I’m looking at bulgogi and definitely going to do this with wrapped rice paper and with the instant sauce.